This week our family will make our annual pilgrimage to my in-laws’ house to celebrate Thanksgiving. It has become our tradition for many years, and I love it. They live in the quaint small town of Hendersonville, NC. This year I will be participating in the City of Hendersonville Turkey Trot for my 5th year in a row. The first couple of years I did it by myself. Now it has become a family affair with all of my in-laws and my kids. My husband, who is a fantastic cook, stays home to prepare our feast. 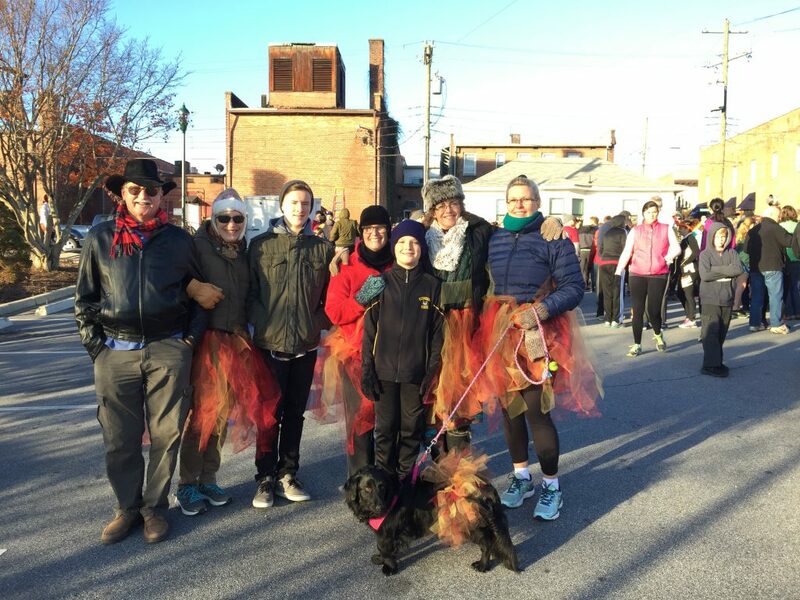 This is us at last year’s Turkey Trot. Thanksgiving has become my favorite holiday. There is no worry about getting presents. It’s just a time to be with family and friendsthat you might not see often. You can catch up and share stories. Our kids can learn from hearing people’s different stories.It’s especially important to share your stories in their high-school years. Ourkids are in that time of their life when they know “adulthood” is approaching soon. While running errands my son asked, “What’s it like being an adult?” I had to pause for a moment as It was not a question I was expecting. Plus, in my mind, not one that I can answer in just a few sentences. My short answer to my son was “its about learning how to live on your own, to find a job that you enjoy, and finding your path to the life you want.” I added that I would share my story during the Thanksgiving holiday. This would include my life path, the successesand challenges I experienced as I learned how to be an adult. If we don’t share our stories with our kids, they only see where we are now. They may think we miraculously somehow got to our path in life. They don’t know about our missteps and what we learned from our experiences, and what we would have done differently. Our kids should not only hear about our own stories but of other family members and friends. We all have our unique paths and our kids can learn from each of them. What will my story include? I will share about my experiences in college, how I thought I was going to be a marine biologist, then how I was sure that being a fundraiser was my life’s path because I cause motivated. However, I ended up being so burned out from the long hours and little pay. I lived with my parents because I wasn’t making enough money. How a meeting in an elevator started my joy in a career in training and development. The time I had to decide whether to stay in my hometown in North Carolina or take a career opportunity of a lifetime that would have me moving all by myself to California. How living by myself taught me life skills of finding somewhere to live, the ups and downs of the roommates I had, how to get myself out of debt, finding doctors, and so on. How taking the risk of getting out of my comfort zone and moving to California was the best decision I made for myself. Not only did my career flourish but I met the love of my life. We just celebrated our 19th wedding anniversary. What is your story that you will share with your kids? Tell us in the comments below. Encourage others to share their stories around the Thanksgiving table. I guarantee your kids will get some great life lessons that will help them as they move forward into adulthood.